I clocked in my half-century on this planet (at least for this go-around) at the end of April. When my close friends asked me how I wanted to celebrate this auspicious occasion, I was quick with my answer. It was time to visit Mecca. No, not the birthplace of Muhammed, instead the birthplace of the leader of my church – the church of Rock and Roll. It was time for this Tramp to take that pilgrimage to the great state of New Jersey. I have been a Bruce Springsteen fan for as long as I can remember. Unlike some fans, I don’t have one clear pivotal memory capturing the genesis of my fandom. It’s just always been. The words to songs like, “Racing in the Street” and “The River” are firmly embedded in my memory, and at 50, there really isn’t much firmly embedded in there now! I had to have learned those lyrics at a young age. Perusing my Springsteen memorabilia provides a few more clues. I still have my Darkness on the Edge of Town and The River cassettes plus sheet music for “Hungry Heart” so I know I must have discovered his music in the late ‘70s. Regardless of when I discovered Bruce, his music has contributed significantly to the soundtrack of my life. I can’t think back to high school without remembering “Cadillac Ranch” screaming from the speakers at one of our parties. I also recall discovering his first few albums a few years later, wanting to be Crazy Janey, and loving the raw voice, horns and piano that dominated Greetings and TWIESS. I grew up in a small town in the Ottawa Valley and never did the concert thing. Consequently, I didn’t experience my first Bruce concert until the reunion tour hit Toronto in 2000. Since then I’ve seen him 15 times, sometimes travelling over 10 hours for a show – hello Hershey, PA! My friends and co-workers think I’m some kind of stalker for seeing him that many times (often multiple shows during one tour) but I tell them I wouldn’t even crack the top 100 as a fan. Hell, probably not even the top 1,000. 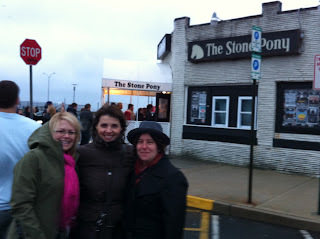 So, at the end of March, I headed to Jersey with two close friends and fellow Springsteen fans. We planned our trip to coincide with his Izod shows in East Rutherford, but first on the agenda were visits to the hallowed Springsteen sites – our own personal stations of the cross.
. . . well, at least a version of Bruce, at a place where he has played so often. 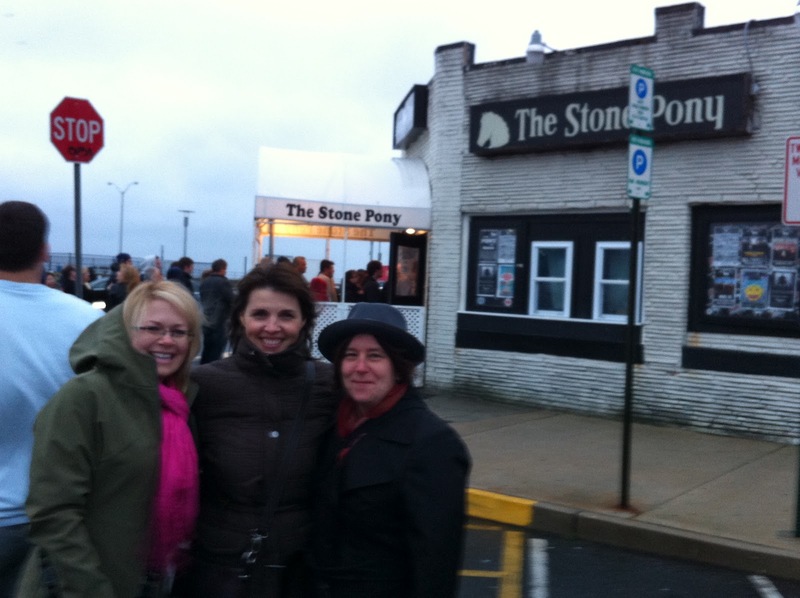 Outside the fabled Stony Pony waiting for the Tramps Like Us show to start. Myself (far right) with Laura Cornish (far left) and Kimberly Wright. A lovely fellow from Wales took this photo. Everyone we met on our journey was incredibly friendly and helpful. We spent over an hour in Greetings from Geralyn, a wonderful store on the boardwalk that repurposes record albums. Glenn, one of the owners and our new best friend, introduced us to J.J. (whose actual job title on the boardwalk eluded us) who gave us a backstage tour of Convention Hall and the Paramount Theatre as well as a brief history lesson on Asbury Park. With our new friend Glenn in front of the great wall of Bruce. We were also fortunate enough to meet Madame Marie’s son Stephen. There wasn’t anyone in the in the historic booth on the boardwalk when we walked by, but we took a chance and called the number on the sign. We were invited to Stephen’s apartment that evening where we each had our fortune told. 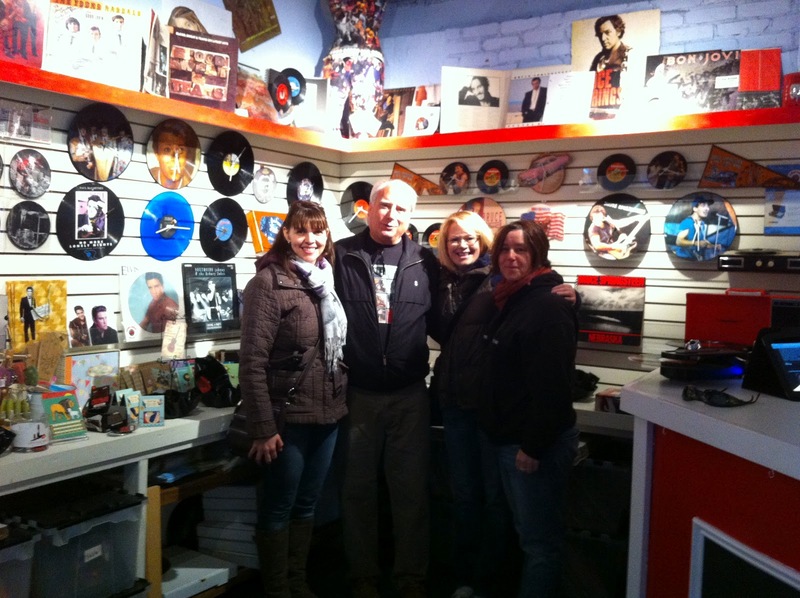 Yes, we went to a complete stranger’s house, but it was all part of our Bruce adventure. 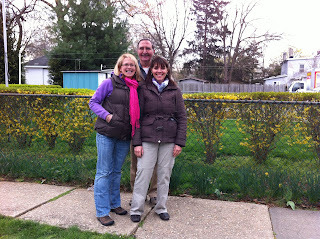 In Freehold, Ed, who now owns Bruce’s former home on Institute Street, was kind enough to tell us we were posing by the wrong tree (“Sorry to disappoint you girls”) and took our photo by the correct one. In fact, any time we asked a complete stranger to take a photo of the three of us, no one looked at us strangely or turned us down. It seemed perfectly natural in this part of the world to find people wanting to have their picture taken in front of a street sign or a non-descript little house. Ed, the owner of Bruce's former home on Institute Street. Our journey also included a quick side trip to New York to watch a live taping of The Daily Show with Jon Stewart. After that, it was back through the tunnel to see Bruce and the band at the Izod Centre on April 2. We normally purchase general admission tickets in order to participate in the frenzied camaraderie of the pit, but we were just as happy to have seats this time. It was a religious enough experience to partake in the “romp in the swamp” with the hometown crowd. They didn’t disappoint. From the opening chords backing Bruce’s quirky Vegas-style self-introduction to the final notes of a foot-stomping, booty-shaking “10TH Avenue Freeze-out” the crowd was on their feet, dancing, singing and clapping. Wearing our new matching Stony Pony hoodies at the Izod show! The new songs from The Wrecking Ball fit seamlessly into Bruce’s extensive canon of music, and I loved the addition of the horn section. They added a new layer of energy – as if more energy could even be possible – to the show. It was also heart-warming to see the fans welcome Jake Clemons into the E Street fold. I don’t think anyone expects him to replace Clarence – no one ever can – but his presence on stage seemed natural and provided a cosmic symmetry between this show and the last tour. The interplay between Bruce and Jake was fun to watch as well. It wasn’t quite Scooter and the Big Man busting the city in half, but rather an older and wiser version of Scooter placing a fatherly arm around the new young saint in the city and showing him where all the good bars are located. It also must be an incredible experience for Jake to bear witness to the outpouring of love for Clarence that has occurred every show on this tour during “My City of Ruins” and “10th Avenue.” What a gift. Speaking of “10th Avenue,” Bruce’s move in the introduction where he grabs the mic stand, drops to his knees and then proceeds to grip the mic with his legs, bending backwards until he’s completely horizontal: sexiest move in Rock and Roll. Gets me every time. Every single time. That drop is a rocket shot directly to . . . well, I think you get the idea. When Bruce promises you’ll leave his show with your voice aching, back aching, hands aching and sexual organs tingling, he delivers on that promise. Night after night, after night, after night. Our only regret from the trip was not taking in the second Izod show. But there were families and jobs to attend to; and besides, we got to see him again in Buffalo on April 13. There is nothing like seeing Bruce in Buffalo. This town always delivers a quality, fun experience – from the pre-show activities right to the post-show commentary and breakdown in whatever watering hole tickles your taste buds. In Buffalo we were able to hook up with some people we met at previous shows. That’s another cool thing about heading out on the road to see a Springsteen show – the friendships you forge along the way. My friend Kathy and I joke that we’ve really only known each other for 10 minutes . 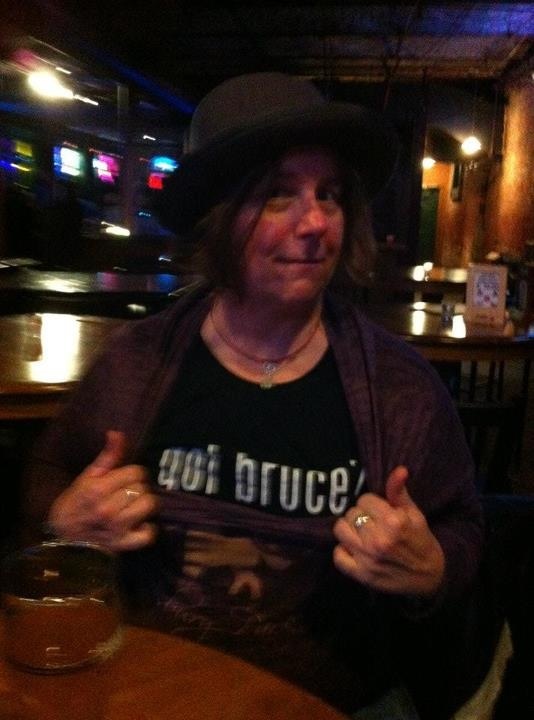 . . long enough to share a conversation about Bruce over breakfast in a Cleveland hotel. We were both in town to see the Springsteen exhibit at the Rock and Roll Hall of Fame and his concert at the Quicken Loans Arena. I happened to admire her bag that featured the November 2007 Rolling Stones magazine cover with Bruce. The bag wasn’t available in Canada so she offered to purchase one in her home town of Rehoboth, MA, and send it to me. We’ve been e-mail and Facebook buddies ever since. Tramps from all over! 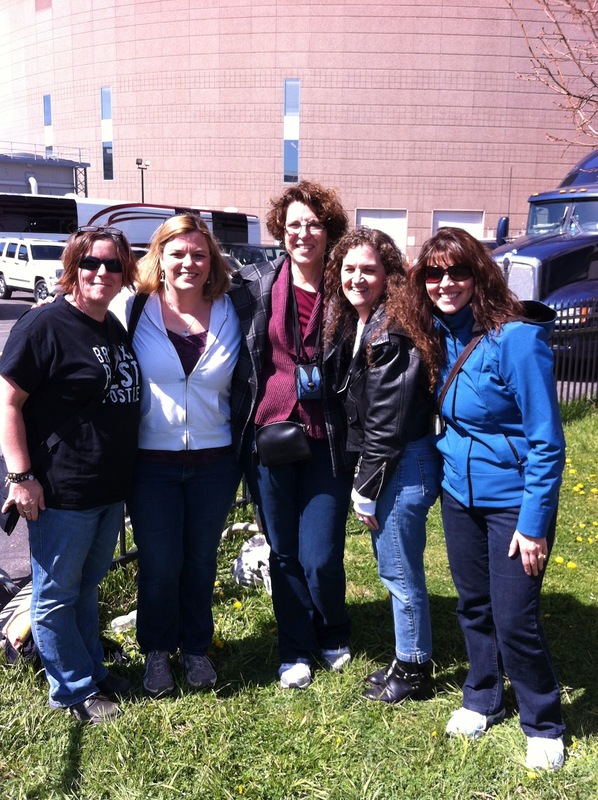 My Rehoboth friend Kathy (second from left), Kimberly and two other Bruce fans that Kathy has met on the road at another show! Me and my friend Caroline. 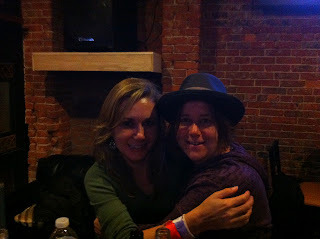 We met at the 2009 Buffalo show. The Buffalo show was poignant in that this was the site of Clarence’s last show with Bruce and the E Street Band – the last stop on the Working on a Dream tour, November 22, 2009. That 2009 show was truly a love fest between Bruce and the fans. It was almost as if everyone knew things would never be the same again. Bruce didn’t seem to want the night to end; neither did we. The 2012 show didn’t disappoint either. Although we had general admission tickets, the train to the land of hope and glory carries losers and winners, and we were not fortunate enough to win a trip into the main pit this night. However, we didn’t allow this to dampen our spirits; we were in the building. The set list differed from Jersey with “Rendezvous,” “Mountain of Love” and “Point Blank” as tour premieres, along with a few other variations. We also got to celebrate Max’s birthday. 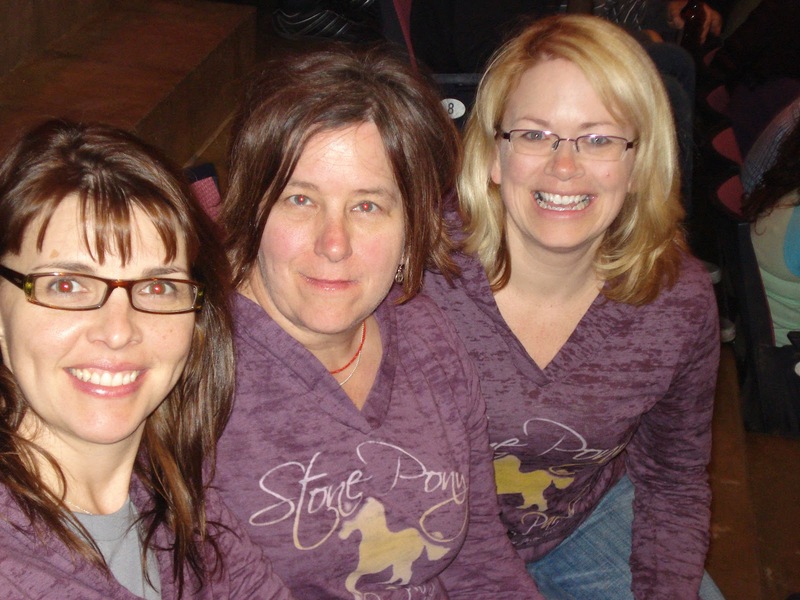 Coincidentally, we celebrated Stevie’s birthday at the 2009 Buffalo show. Bruce must like to schedule the Buffalo shows around the band’s respective birthdays. All-in-all, a very rewarding and spiritual April for this pilgrim. 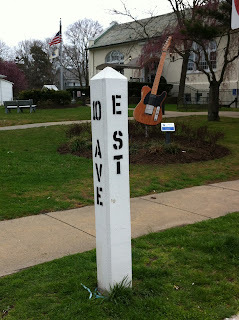 I would truly recommend that any Springsteen fan make the trip to Jersey. It was worth every second. Driving between Asbury Park and Freehold we were intensely aware of being in his hood – roads that he has driven and continues to drive, and enjoying the scenery with which he is so familiar. Places, buildings, streets and roads featured prominently in his lyrics were given a face, and for a few days we were those fuel-injected Tramps sprung from cages on highway 9. I feel truly blessed as I embark into this new decade and welcome the adventures the next half-century will bring. I know it will definitely include more Bruce. How do I know this? Well, I have tickets for the August shows in Boston and Toronto and I JUST KNOW there will be more shows added along the line . . . perhaps another fall tour finale in Buffalo.